Compressor, Studio compressor from Dangerous Music. Dangerous Music confirms its announcement made last November and launches its new two-channel Compressor. 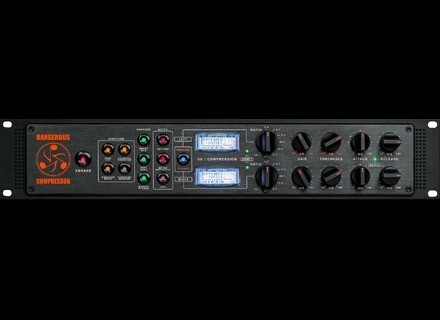 The Dangerous Compressor is a two-channel rackable unit that can operate either in stereo or dual mono mode, that latter using two independent signal paths. You can use the stereo mode with stereo instruments, stems or full mixes. Dangerous Music used here VCAs on each channel as well as a dual true stereo detector. Along with the manual ratio, gain, threshold, attack and release knobs, the Dangerous Compressor uses algorithmic attack and release presets featuring selected time constants. A Smart Dynamics function automatically handles the signal peaks with two independent slopes in the detection circuit, including one control stage for average level while the other stage is dedicated to fast transients. Last, a Sidechain algorithmic circuit includes a low-cut and a Sibilance Boost, the latter increases the high frequency sensitivity, which allows for the compressor to react easily on the higher part of the spectrum, an interesting feature if you want to remove sibilants from vocals or tame a harsh cymbal sound for example. The Dangerous Compressor is available for the US street price of $2799. More info at www.dangerousmusic.com. Free Lexicon 480L IR by Grant Nelson Grant Nelson offers its personal library of impulse responses from the Lexicon 480L digital reverb unit for free. Audio-Technica AT5040 Review Since its introduction, Audio-Technica's new high-end mic has provided plenty to talk about.